"It’s OK, you can call me Mud"
Congressman, Senator, Madam Speaker, Mr. Chairman — take a breath — Representative, ranking member, Mr. Leader, Madam President. Anyone who has ever stopped to think about how to address a member of Congress can see that congressional titles are plentiful. With a title to match nearly every duty in the legislative body, many members can be rightly addressed by several different honor-filled titles. Options are nice, we Americans think, but this array leaves well-meaning constituents, eager-to-please staffers, tongue-tied reporters and fast-talking lobbyists in a bind. How do we choose the right title when addressing a member of Congress? And what happens if we flub it? Or, better put, when we flub it — because title flubs happen often. Members of Congress themselves have been known to mangle a colleague’s title. During one of last year’s heated congressional hearings on the No Child Left Behind law, House Education and Labor Committee Chairman George Miller (D-Calif.) was in the middle of grilling Education Secretary Margaret Spellings when he referred to her as “Madam Chairman.” Did you mean “Madam Secretary,” Mr. Chairman? A lawmaker’s solution to this confusion is the politically savvy one. Many of them told The Hill that they ask everyone — constituents, staffers, co-workers — to call them by their first name. Judith Martin, the columnist known as Miss Manners, suggested that politicians’ insistence that they be called by their first names further confuses the issue. “You really can’t blame the public for getting these things wrong when politicians who are running for office are always encouraging them to call them by their first name or their nickname,” Martin said in a phone interview. Still, titles, in many ways, go against the American psyche, Martin said. “Titles in general Americans have problems with because it’s against our nature to have the kind of complicated hierarchies that existed elsewhere,” she said. By elsewhere, Martin principally means Great Britain, where titles are a part of history and whose government America’s Founding Fathers used as their example. But a history lesson isn’t enough to keep us from calling out the wrong title when approaching a member of Congress. Our saving grace? Intention counts, experts said. Someone attempting to use the right title with a Congress member is showing respect for him or her, and that’s what titles are meant for. Using an incorrect title “is not a great crime, it’s a small one,” Martin said, adding that she doubts Congress members who are wrongly addressed would “do anything but smile.” “If [a Congress member] were to insist upon a title, I think a lot of people would say, ‘Oh, he’s gotten a little too big for his britches,’ ” she said. Whatever it is Congress members prefer to be called, there’s at least one who said he’d answer to almost anything. • Nancy Mitchell of The Etiquette Advocate said all Congress members are bestowed with the honorific “The Honorable” before their name. The title is normally written rather than spoken but can be used when a member is introduced before making a public appearance. Congress members can keep “The Honorable” honorific after they leave office. Senators may continue using the title “Senator” after leaving office. • The title “Congressman” technically applies to members of both chambers, but it is used only to refer to members of the House, said Judith Martin, also known as Miss Manners. • A female member of the House can be casually referred to as “Congresswoman,” but should be referred to as “Congressman” when making an official introduction or in print, Mitchell said. The same is true for the chairman title (a female chairman would be “Madam Chairman” rather than “Madam Chairwoman”). However, these rules are subject to the female member’s preference. • Committee and subcommittee chairmen should be addressed as “Mr. Chairman” or “Madam Chairman” in the salutation of a letter, but “Senator” and last name or “Mr.,” “Mrs.,” “Miss” or “Ms.” and last name in other usage, Mitchell said. The House Speaker is “Mr. Speaker” or “Madam Speaker” in a letter and in conversation. • “When you don’t know a name … ‘Sir’ or ‘Ma’am’ speaks volumes,” said Fannie Allen, the director of the Allen Etiquette Institute. "There's an Ultrasound in My In-Box!" Many grandparents are meeting their grandchild... in an e-mail. It took a little prodding from her pregnant daughter. But when Gayle Morris opened her e-mail, she met her grandson for the first time. From his first official photo, there he was looking back at her. He just happened to be in utero. “That's a real life there! It's a real person!” she said at first seeing her grandson, Jack. The Beaufort, S.C., grandmother-to-be had been eagerly awaiting the arrival of her first grandchild. Seeing his tiny hands and not-fully-formed features in the e-mailed ultrasound made it all real. The excitement she had been feeling was no longer just a hope or promise. Once purely a medical procedure, ultrasounds have evolved into a full-scale emotional experience, a first meeting between parents and child –– and in some cases, when you're lucky, grandparents and grandchild. Nowadays, new parents can leave maternal medical facilities armed with the makings of one fine announcement –– fax-grade paper printouts, sound files of heartbeats, even full-scale 3-D/4-D ultrasound DVDs equivalent to in-utero home movies. Thanks to constantly evolving technology, the big “We’re pregnant!” announcement and subsequent updates can come in all sorts of new shapes and forms, including e-mailed messages and photos, sound files of heartbeats, and ultrasound DVDs. The natural urge to rush to the phone to shout the joyful, yet very personal, news from the rooftops used to take time and effort as grandparents could only call one person at a time. Now you can broadcast the announcement far and wide with one simple click of the “forward” button. Start by pinpointing how public the parents are ready to be, including what, if any, restrictions there may be on using the ultrasound photos. Are they just intended as special, private moments for the family –– or is it okay for you, the grandparents-to-be, to use them as the warm-up for the photos with which you’ll soon be inundating every person you meet? So, there's the first little digital glimpse of your future grandchild. Now, how to display the image? Grandparents are known for their love of sharing their grandchildren’s photos, and this very first picture, the ultrasound, is no exception! For those sticking with traditional printouts, there are now ultrasound picture frames specially designed to hold that first glimpse of your grandbaby. Many baby stores, including Babies "R" Us, carry them. A particularly clever one at Bestbabyshower.com features two photos, one for the “coming attraction” ultrasound shot, another for the “just arrived” birth picture. If you’re ready to enter the realm of Web video, Animoto is a new service that instantly turns photos submitted by users into animated slideshows set to music. The service can essentially give your grandbaby his or her own automated movie trailer. The files can then be e-mailed to friends, sent to mobile devices, or posted to social-networking sites such as Facebook or MySpace. Prices range from free for a 30-second clip, to $3 for an individual full-length clip, to $30 for an annual membership with unlimited clip creation. "E-Mail Is There for the Asking"
It’s been a while since I mounted a big holiday open house, and I have run into a modern-day dilemma: whether to send invitations by traditional mail or use e-mail. A quick check with friends and office colleagues turned up a distressing difference of opinion. Snail-mail proponents cite the lovely memories of any mail that isn’t junk or a bill: the joy of opening a personally addressed—handwritten!—envelope to find a special invitation inside. Isn’t the whole idea of a party to make friends feel special? Shouldn’t that start with a hand-picked invitation? Card stock invitations also become part of the seasonal décor of a home, enhancing the holiday spirit every time you see them. Both sides agree that e-vites are good for some types of parties but not others. A Fourth of July picnic? No problem with an e-vite. A wedding celebration? That’s a job for the letter carrier. But a holiday party that is dressy but not formal seemed to fall somewhere in the middle. Does an electronic invitation fit the overall nature and goal of the event? Are most of the recipients e-mail and computer savvy? Do we know recipients well enough to be sure that they will not misinterpret the informality of this approach? Is it critical to keep costs down? What is the time frame for issuing invitations and receiving responses? Are we targeting a fairly homogenous group? In the end, there is really no perfectly correct way to invite friends to your home. The only things that really matter are that you do invite then and that they feel welcome when they arrive and sorry when they must leave. Q: I bought a seven-session package with a personal trainer at my gym. When the package is done, assuming I’m pleased with the results, should I tip the trainer? And if so, how much? A: Although they make you look better, personal trainers are not hairdressers (who would expect a tip). And although they make you feel more confident, they’re not therapists (who wouldn’t). “So, it’s a bit of a gray area,” says self-styled “etiquette advocate” Nancy Mitchell, who gives local seminars and courses on manners. She supports people who tip after each session with a trainer, as well as ones who offer up something only when they’ve reached a milestone and at the holidays. In your case, Mitchell says it’s appropriate to wait until the end of the seventh session and then give a tip worth 20 percent of the package price... But ask first at the front desk if your gym bans cash tips. On a typical day, Paulo Miranda uses his tip money to pay for his taxicab’s fuel. Ride after ride, customers usually dole out the standard rate of 10 to 20 percent. Sometimes, he’s pleasantly surprised with a few extra bills. But one day, a customer surprised him with something different. The man didn’t have enough cash to even pay the bill. Fresh from the grocery store, the customer handed him a frozen turkey instead. “It’s food. I took it,” said Miranda, a driver for Maffei’s Taxi Service in Danbury. “If you don’t have money, at least you give something.” Still, Miranda doesn’t want to start getting paid in produce. “Those $30 (a day in tip money) will dictate whether they will make good money or no money at all,” he said. The world of tipping is hardly standard for workers and consumers. Instead, whom and how much to tip can be murky. Sure, most people realize waiters and waitresses depend on tip money. But what about hair salons? Should an owner cutting hair get a tip? What about a hotel maid? A dentist does a service. Should they be slipped an extra $5 for a new filling? A consumer might know how much to leave at the local diner, but what do you do elsewhere? William Michael Lynn, associate professor of consumer behavior and marketing at the Cornell University School of Hotel Administration, said consumers seem to be handing over cash to more and more service workers these days. “We tip service providers more than any other country I know of,” he said. “We are high in extroversion. We are high in neuroticism and low in psychoticism and all those contribute,” Lynn said, referring to why Americans tip. In the past 15 years, the standard restaurant rate has risen from roughly 15 to 20 percent. “The major reason people tip is to get the server’s approval or to avoid the server’s disapproval,” he said. Those looking for approval—they don’t want the server to think poorly about them—usually pay more than average. Eventually, the average creeps up. Lynn said that argument could partly explain why more service workers get tips today, including counter workers at places like Dunkin’ Donuts. Plus, when someone puts out a tip jar, consumers begin feeling an obligation to hand over cash. Zabriskie, founder of a company called Business Training Works, said people are much more likely to tip workers they actually meet. Bellhops often get more money than hotel maids, Zabriskie said, because people don’t have to face the maids in person. Nancy Mitchell, an etiquette trainer based in Washington, D.C., said poor tipping can translate into a poor image for business people. “You should never be seen as a penny pincher,” said Mitchell, who runs The Etiquette Advocate. Zabriskie said many businesses tell their employees to tip 20 percent for any service. “They don’t want to have a bad reputation of being cheap,” she said. Nathalie Lariviere, owner of Sandy Hook Barber Shop in Newtown, said her customers consistently give 20 percent. Lariviere said customers often tip her, despite the traditional view that salon or barber shop owners shouldn’t get tips. Lariviere said people in service work tip more because they know what it’s like to depend on the gratuity. “I’m an over-tipper”¦nine times out of 10, they are counting on it,” she said. Zabriskie said sometimes tipping can be awkward. Most professionals don’t require extras, she said. “Tipping your dentist would be weird, or your lawyer,” she said. But for standard service workers, when in doubt, hand over a tip. “You have nothing to lose by doing it, and it’s always appreciated,” Zabriskie said. In the movie "A League of Their Own," etiquette lessons were mandatory for the professional women baseball players. That's Hollywood, circa 1945. Today in the real world, good manners are increasingly hard to find. From drivers with road rage during rush hour to cell phone junkies yapping on the phone in a restaurant and college athletes wearing flip-flops to a White House ceremony, it seems the standards of etiquette have changed dramatically. "When I grew up, etiquette was taught in the schools, in the home, in the church — it was part of a complete education," said Nancy Mitchell, a good manners guru. Mitchell teaches a three-hour "extreme etiquette" crash course in Washington, D.C., which promises to teach students everything from how to properly shake hands and make introductions to how to mingle at a party. Most of Mitchell's students are men and women in business, looking for a competitive edge. "In social settings and trying to network, it's important to have some social graces, and for people to notice that you do care how you're presented," said Jackie Wright, a company project manager. Several people from the financial investment firm where Daniel Turney works enrolled in the etiquette class. "We have many clients in the office, so we thought it would be good to brush up on our etiquette skills," Turney said. 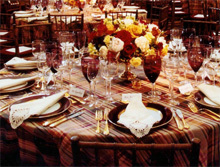 Mitchell believes that competitive work environments are leading to a renewed interest in etiquette. "It's a cool thing to do, because people are smart enough to know that it helps them get ahead," she said. Mitchell hopes her classes will help fight bad manners, but she says the best place to start is at home, teaching the next generation by example. "If you're not showing them, giving them the skills, and then exhibiting them yourself, they're never going to learn them on their own," she said. You can't teach your kids proper manners if you don't know them yourself. 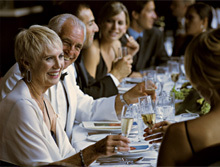 Mitchell points out the most common etiquette blunders people make. If you're at dinner with friends or family, turn off your cell phone and put away the BlackBerry. Nothing says "I don't care about you" more than completely ignoring the people sitting right in front of you. When you get invitations in the mail, you're supposed to reply within 48 hours. And don't bring a guest to the event if the invitation is only addressed to you. If they wanted you to bring your child or a date, the invite would have mentioned that. Always wear a name tag on your right side near your shoulder. That way you can glance at the person's name as you're shaking hands. And remember, etiquette is always about making other people comfortable, so don't call attention to anyone who has less than perfect manners. That's just rude. "Styles: Reply or Else I'll... "
R.S.V.P. They’re just four letters, and yet, they are apparently tremendously difficult to comprehend. When 26-year-old Erin Brunner sent out invitations to her August wedding at the Newton White Mansion in Mitchellville, MD, just 70 percent of her guests dropped the response cards back in the mail. …Nancy Mitchell, a protocol and etiquette consultant who is a 2003 alumna of the Protocol School [of Washington], worked as director of special events and protocol at the Library of Congress for more than two decades before she started spreading good manners on her own. Mitchell said Washington is a relatively polished city, which is one of the reasons she sees such a demand for classes. Mitchell teaches seminars at George Washington and Stratford universities and will offer an evening class, “Extreme Etiquette,” at Dupont Circle’s First Class (takeaclass.org) Oct. 26. The class covers etiquette sins (poor listening, failing to put the comfort of others before your own)—plus skills to improve your dining manners and electronic etiquette…..
Nancy Mitchell hates having to be so blunt, but your etiquette aptitude is disturbingly low. Honestly, there’s a good chance that it stinks. We live in mean and angry times, and our days are filled with coarse and crude behavior. But Mitchell’s got her own battle plan for extreme times like these. Which is why Mitchell, who was director of special events and public programs for the Library of Congress for 23 years, is standing in a classroom enumerating do’s and you-shouldn’ts for her Extreme Etiquette Seminar. “I’m going to send you out that door tonight with a manners makeover,” Mitchell, 59, announces to the small group seated in a chilly third-floor room. The seminar is part of the First Class, Inc. learning center, and this particular class is being held in Dupont Circle. Inside the room is rose-colored carpeting, a fireplace and a folding table full of neatly positioned china. But mostly there is a sense of decorum, an air of setting things right again. This, she tells her charges, will be a lesson in how to put others’ comfort above your own. Not that the fine points of good manners are a completely selfless act. You want to get ahead in this town? Learn some manners is Mitchell’s advice. “Who’s in sales?” she asks, surveying the 20 or so people who’ve plopped down $29 for this experience. A woman in her twenties in the back slowly raises her hand. She’s a brave soul. After all, this is a class where everything you do and say could potentially be picked apart. “C’mon, who’s in sales?” No one else replies. “Everyone raise your hands!” Mitchell squeals. Hands creep up, then, finally, everyone seems to get it. They’re all in sales! Only 7 percent of your overall impression is from the actual words you speak, she tells them. Fifty-five percent of the message you send is from your appearance. The rest? It really doesn’t matter, since, according to Mitchell, you’ve only got about five seconds to make that first impression. “Five,” she mouths and holds up her hand. And it can take you months, even years, to undo it, she stresses. The room suddenly sits up a little straighter. Here’s a man in a suit and tie. That’s good. Here’s woman in a pantsuit. Wonderful. A guy in jeans and T-shirt. Hmm. And then you see it, the huge obnoxious wireless headsets affixed to the ears of one couple just arriving. Mitchell greets them—politely—but you know what she’s thinking. “It’s okay to say that I’m going to do this for me, but it’s also for the good of society in general.” She says reassuringly. Standing, slender in a tailored mustard pantsuit, Mitchell wears a single seashell-like disk necklace and matching ivory earrings. And, she’s slipped on a pair of smart cobalt glasses that rest on the tip of her nose. Etiquette, she tells the class, originated in the courts of Louis XIV, who wanted people to take pride in the grounds of Versailles. “Etiquette literally meant ‘stay off the grass,’ ” says Mitchell, holding up a jumbo card with ETIQUETS in bold black letters, echoing the term for Louis XIV’s limit-setting signs. Caterer Ernest Suesbury opens his notebook, preparing to jot down Mitchell’s pointers. He wore blue jean and a navy blue-and-orange polo shirt to class, but he was one of the early ones to arrive—which isn’t a bad thing, unless of course, you’re arriving early for a dinner party. Suesbury decided to bone up on his etiquette because his work brings him into contact with so many dignitaries. Etiquette often involves simple, everyday matters. Do we answer our cell phones while out with friends? Mitchell asks. “It just might be,” the woman who’d worn the earpiece retorts with a chuckle. What about BlackBerrys? A man waves his in the air. Uh-uh. When going through a receiving line, never conduct business. When at a buffet-style event, don’t bring two or more plates back to your seat. “The host didn’t invite you because he or she thought you were hungry or thirsty,” Mitchell says, her voice a little shrill. And don’t even think about asking for special foods unless the host offers. And nobody—nobody—likes a limp handshake. When did it all go to seed? When did people stop sending thank-you notes (e-mails don’t count) and cutting you off on the freeway and blowing their horns because you’re driving the speed limit, and bumping their grocery carts into you without bothering to day, “Excuse me”? She’s been fighting back for decades. During her tenure at the Library of Congress, she planned more than 400 of the institutions events, from small meetings to black-tie galas honoring foreign dignitaries. Since retiring, she’s been teaching etiquette and protocol at George Washington University, and two years ago started her own consulting firm, The Etiquette Advocate. The group members assess their etiquette aptitude as Mitchell goes over the “correct” answers for the manners quiz she’s handed out earlier. Question 18: When waiting for your guest to arrive at a restaurant, you may order a beverage or cocktail. “Who said false?” asks Mitchell, peering over the tops of her blue frames. Brenda McCaskill decided in 1984 that it was time to buy her first home-or at least learn as much as she possibly could about the topic. ….. In a stroke of luck, McCaskill's hunt for data coincided with the opening of First Class, Inc., a Dupont Circle nonprofit adult learning center. She happened upon a catalog and signed up for one of its maiden courses. …… McCaskill estimates that she's taken roughly four or five classes each year since First Class opened, which works out to about 100 courses in the lifetime of the organization. The courses that stand out in McCaskill's mind aren't necessarily the ones that yielded a tangible end result but those in which she picked up a skill easily applied to her everyday life. A vocabulary class, McCaskill says, "really got me into working more crossword puzzles." "Conquering Clutter: Get Control of Your Life!" enabled her to get a handle on junk. "That one really helped me," she says. "It really helps if you're cluttery-not filthy, but cluttery." She also got a lot out of an etiquette course taught by Nancy Mitchell. "She's really, really good," McCaskill says. "We learned to fold a flag, how to work a name tag, when and how to balance your plate, glass, and napkin in one hand and walk through a receiving line." Q: Can I use a first name with a business associate I've never met before? Is the answer different if the person is younger than I am? A: Generally, no, according to Nancy Mitchell, the owner of The Etiquette Advocate, which offers etiquette and protocol training. "When meeting, corresponding by e-mail or speaking by telephone with colleagues, clients or other individuals in a business context, it is courteous and respectful to use an honorific (Mr./Mrs./Ms./Dr./General, etc.) and the last name of the individual when addressing her/him for the first time," she says. "This rule applies regardless of the gender, the age or the rank/position of the individual whom you are addressing." Mitchell says you may begin with first names when the person asks you to, when he or she signs e-mail messages with just a first name, if you're dealing with someone on your level or below in rank or age, when you're working with someone over an extended period of time or when you've asked for (and received) permission. However, Mitchell says you should continue to use an honorific and last name if someone far outranks you in position or age-your boss and other senior-level managers, important clients, members of the clergy, a colleague's mother, elected officials, etc.-unless the person insists you use a first name. And don't use an honorific when introducing yourself or placing a call, Mitchell says. Correct: "Hello, I'm Nancy Mitchell. It's a pleasure to meet you." Incorrect: "Hello, this is Mrs. Mitchell." "A Minder to Mind Your Manners"
"It's a wonderful phenomenon," said Nancy Mitchell, who has taught social etiquette classes at George Washington University and other colleges in the Washington area since 2002 and who worked as director of special events and protocol for the Library of Cong5ress for more than 20 years. "We're coming full circle from the 60's, when everybody was letting it all hang out and everybody was taking potshots at rules and defying authority." "Etiquette Guru Teaches Vital International People Skills"
Use a firm grip when shaking hands. Don't answer your cell phone during a meeting. And for heaven's sake, be on time. Apparently not, or Nancy Mitchell wouldn't have a reason to start her business. For more than 25 years, Mitchell has been helping professionals mind their proverbial P's and Q's, first at the Library of Congress and now as owner of The Etiquette Advocate, which offers etiquette and protocol training to individuals and corporations. Mitchell served for 23 years as the federal library's director of special events and public programs, where she planned more than 400 events each year ranging from black-tie dinners to poetry readings. As the library's chief protocol officer, she was responsible for making sure the institution's standards measured up to some pretty tough customers-heads of state, foreign diplomats and even Queen Elizabeth. As Mitchell battled with political seating charts and made sure visiting dignitaries felt a home, she started to see a need for increased understanding of the old and new rules of etiquette in today's professional world. She sums up the reason very simply: Good manners are good business." If you offend someone, even unknowingly, it takes attention off the business deal at hand and puts you at a disadvantage. "If you offend someone, that's what's on their mind throughout the whole transaction," Mitchell says. This realization motivated her to do two things: to start her own business and to seek out a teaching position with The George Washington University's Events Management Certificate Program. She now team-teaches classes in protocol and etiquette with Bob Leitzel, a retired military officer and foreign liaison with Department of Defense. In a rapidly shrinking global marketplace, Mitchell stresses the importance of understanding that not every culture subscribes to the American "fast-track" way of business. While Americans tend to get straight to the point in a business meeting, people in many cultures find that downright offensive. They want to hear about your family and personal interests before breathing a word about a deal. Some of Mitchell's favorite students are the young professionals, whose choice of attire reflects today's more informal society-something that doesn't always serve them well in the business world. She's always amazed when they suddenly realize the value in something so simple. "You see a light bulb go off when you say that flip-flops are not a fashion accessory for the corporate world," she says. Mitchell and Leitzel are joining forces with another colleague, Gary Biggs, to launch a company called Protocol Partners, which will provide corporations with white-gloved, hands-on training in business and international protocol. They plan to target companies that have training centers or run conferences where it's essential to make people feel at home-and where the little nuances add up to big deals. Whether she's teaching the right way to go through a receiving line or knowing the proper way to make an introduction, Mitchell never loses sight of her central theme: Good etiquette means putting the comfort of others ahead of your own agenda. If you follow that axiom, you can't go wrong, both in business and in social settings. "People will do business with you if they like you and will do everything in their power to avoid you if they don't," Mitchell says. Good people skills. Now that's the ultimate human resource. "Present and Accounted For: Jolly Advice for Gift Giving at Work"
Nancy Mitchell, owner of The Etiquette Advocate, suggests you ask yourself two questions when deciding whether to give a gift to a colleague or boss. First, are you giving a gift to thank someone (for mentoring, doing great work, support, contributing to a huge success this year)? And secondly, what's the corporate culture? On the first question, if the answer honestly is "yes," you can probably go ahead, Mitchell says. If you have other reasons (you want to stand out, show off, or just think Mike in sales is dreamy), "then you're giving for the wrong reason," she says. And as for the second, your organization's culture largely determines which people you give presents to. Does everyone chip in for a luncheon? Do you do Secret Santa? If you have made an especially close friendship, Mitchell says, and there is someone you want to sincerely thank, do it away from others. You don't want to make a big deal of who's not giving and who isn't getting. It's nice to do something small for all the people you interact with regularly. Think holiday cards or baked goods. Creativity can save you money, but only if you let it. If a co-worker has been looking for a particular book and you happened upon it in a used book store, that gift is a neat idea. But when it's a rare first edition and you spend hours looking for the book, it goes from "neat" to "overboard". "Stay away from gifts that are too personal," Mitchell says: clothing, perfume, jewelry. She also suggests no religious gifts, even if you know the religion of the recipient. If you're giving food or alcohol, do your homework, Mitchell says. People might have allergies or avoid certain foods. They could be trying to cut back on calories or alcohol for all kinds of reasons.